I hope your first full week of the new year is starting off well. Almost everywhere across the country is hunkering down for the polar vortex bearing down on us, but not to worry, I’ve got some recipes coming up on the blog guaranteed to warm you right up. Like my latest recipe for a warm and gooey side dish of… cauliflower! I know, I know, cauliflower’s not the first ingredient that springs to mind when you think comfort food, but hear me out. Like many of you who’ve resolved to eat healthier this year, I too am tired of the cookies and pastas and sugary goodies I indulged in too much over the holidays. With this in mind, I decided to take some winter time comfort foods like casseroles and potatoes au gratin and healthy them up so I could enjoy eating better. 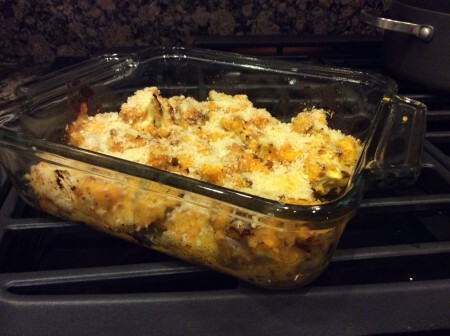 Thus, the pumpkin cauliflower au gratin was born. With healthy, low carb ingredients like cauliflower and pumpkin and just enough tasty ingredients like cheese and breadcrumbs, this dish is a great combination of healthy and satisfying. Serve it alongside whatever you’d like and enjoy the benefits of being healthy and happy. Wash and cut up cauliflower into florets. Place cauliflower on baking sheet covered in aluminum foil and lightly coated with non-stick cooking spray (the foil makes clean up infinitely easier). Bake the florets for 25 minutes until roasted golden brown and set aside. While cauliflower’s baking, bring milk to a boil in a medium saucepan over medium heat. Stir frequently and reduce heat to low as soon as milk boils. Add the cheese, pumpkin puree and mustard to the milk, and cook, continuing to stir frequently for 4 – 5 minutes until everything’s well blended. Add the cauliflower to the saucepan and mix well to coat it completely. Pour the cauliflower into an 8×8-inch baking dish coated with more non-stick spray. Top the whole mixture with breadcrumbs. Bake in the oven for 18 – 20 minutes more until the whole casserole’s hot and bubbly. Serve as a side. 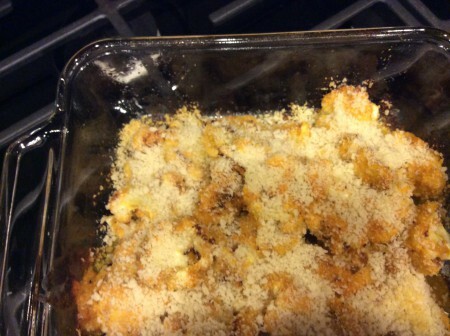 This entry was posted in Recipes, Side Dishes and tagged Au Gratin, Casserole, Cauliflower, Cauliflower Au Gratin, Healthy, Low carb, Pumpkin, Recipes, Roasted Cauliflower, Side Dishes on January 7, 2015 by Paige N..